My latest fish decoy, thanks for looking. 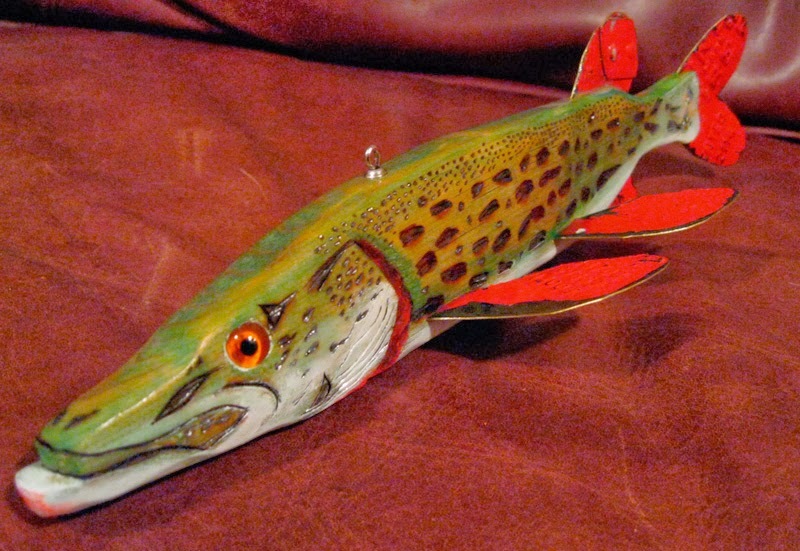 Working Northern Pike Fish Decoy. 12 inches long. 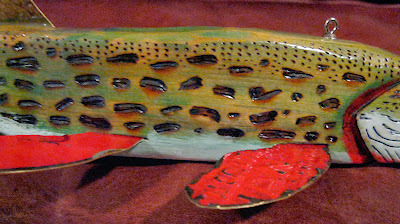 Fins and tail from a vintage INDIAN FIRE PLUG tank lid. 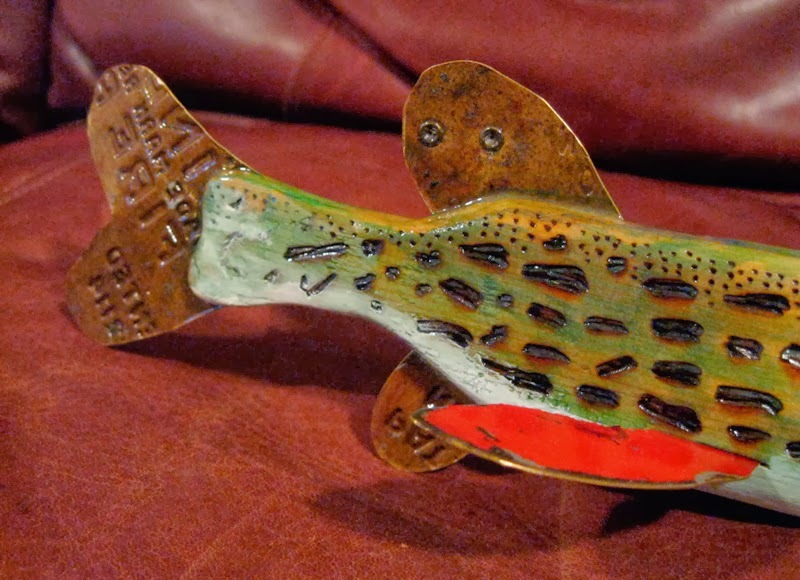 Tail pinned with brass nails, fins locked in poured lead old school. Vintage glass eyes. 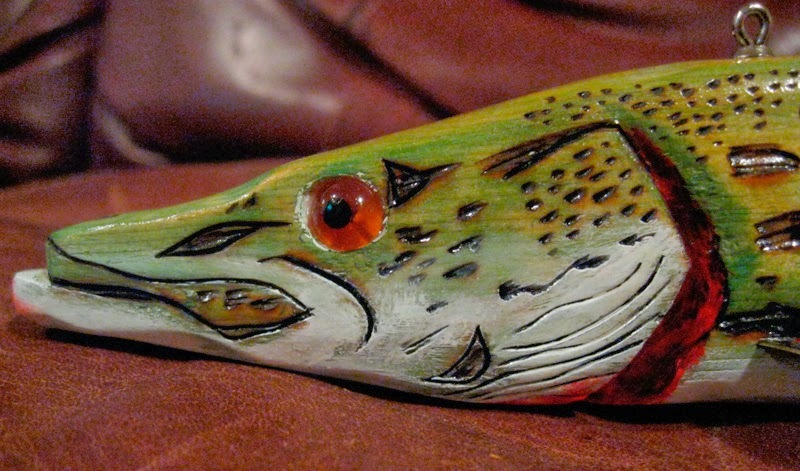 Carved by hand from dried white cedar. Pyrography by hand. Watercolor and acrylic paints with 4-5 coats of spar varnish. 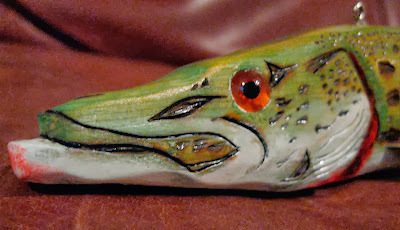 Esox Lucius. When my Dad, Jim Stouffer, (Paw) passed away on November 19, two days after his 73rd birthday, I stayed home from work for a couple of days. It was hard to be around people and I retreated to the basement family cave. Not from my kids and wife for any purpose, but just to be alone and reflect. I guess. I cried a lot. Watched the movies Gettysburg and God's and Generals a lot and worked on this decoy. Came up with the idea to do watercolor for the first time and really enjoyed the wood burning. My Dad would have loved it. It would be in his Christmas Stocking for sure and then proudly on display with many of my best at Mom and Dad's home. Merry Christmas Dad, Love, Me. 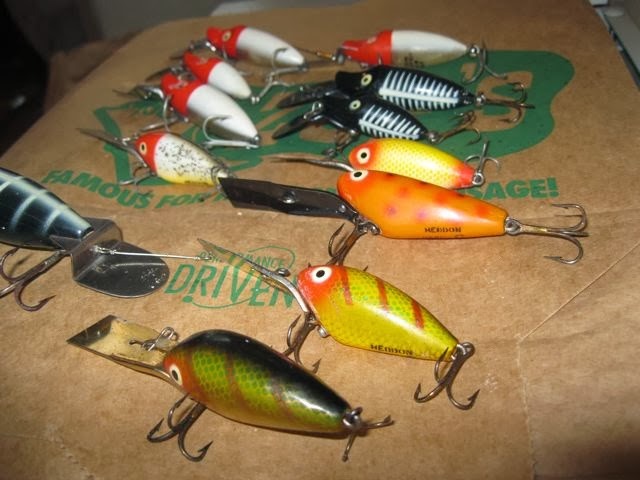 For Christmas my Mom gave me some lures from my dear Dad's tackle box. Most of these were plastic Heddons that he gave to my Grandfather for gifts. 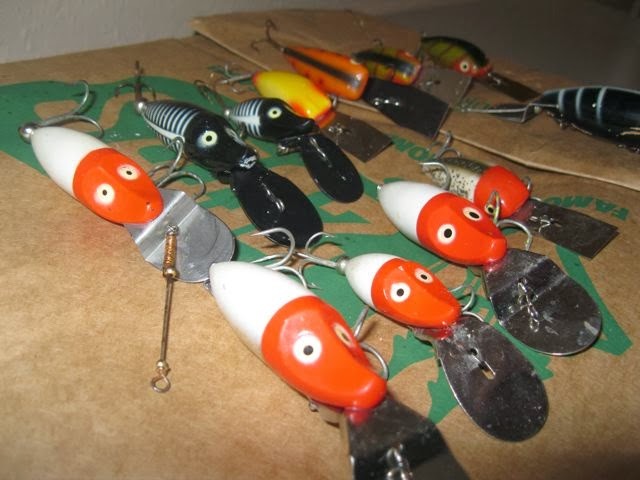 Grandpa liked to fish with them up here. 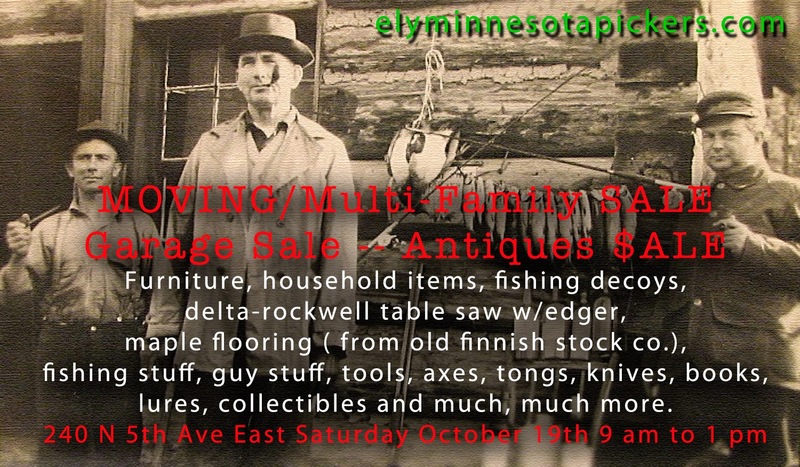 Grandpa brought us first to Ely, Minnesota 44 years ago and more where we all ended up in 1995. Christmas was tough without Dad this year, but I'm so thankful that he got to spend it with Christ, thanks for looking. All cleaned up. First liquid soap and warm water, then WD40 with toothbrush. 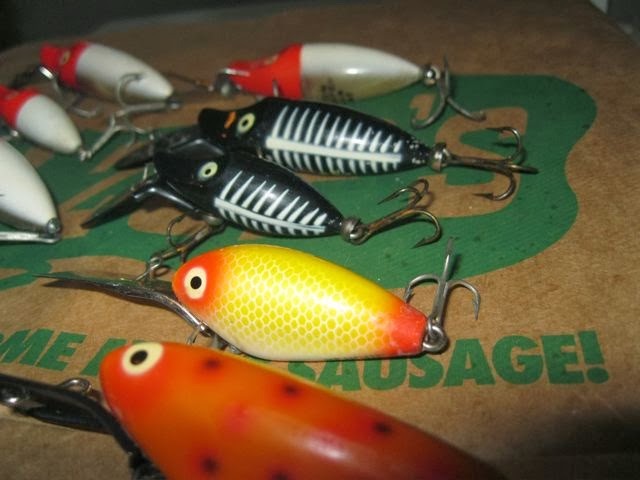 I now see the square lips are Heddon Deep 6. Others are deep dives, tiny deep dives and 1 go deeper. Wood Go Deeper Crap with gold eyes. Has rubs, but I love the white on black color. 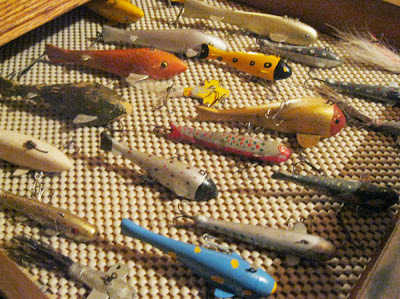 Airplane lures from Ely, Minnesota were used as fish decoys, sometimes called "cheaters" because they had hooks. Many times these smaller decoys were designed to be used as Trout Jigs to fish for Lake Trout through the ice. The flutter and stutter, in swooping arcs, in the water to mimic wounded bait fish that the Lake Trout stun with their tails as they hunt after slapping them... The trout circle back to snap up the wounded bait. 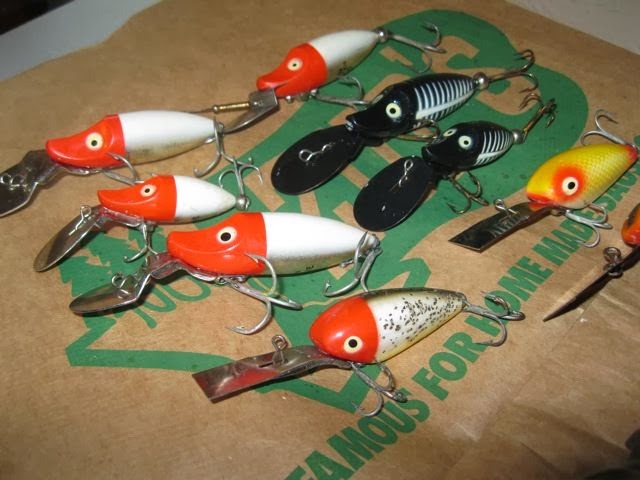 If they bite the cheater decoy/trout jig they are hooked and you've got dinner! 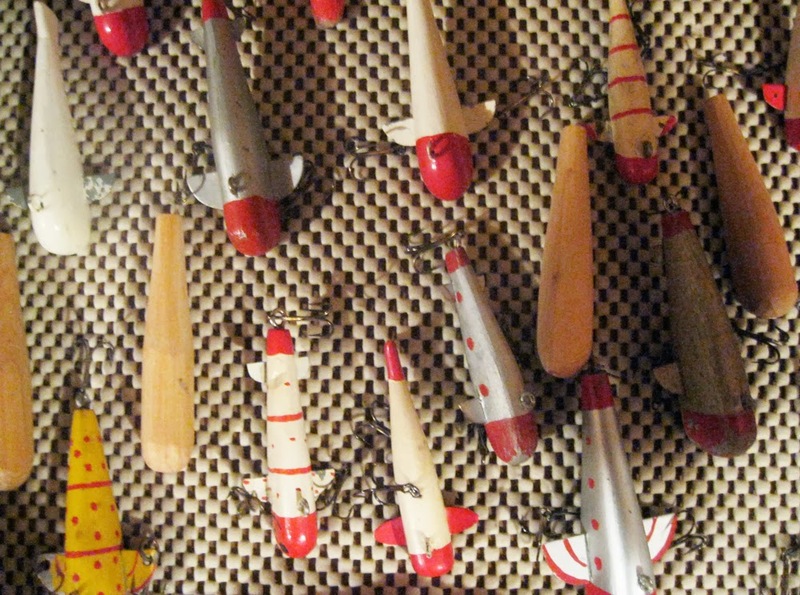 Airplane jigs come in all shapes and sizes, wood and metal. Two of the coolest carvers from Ely, Minnesota were Johnny Novak and Frank Mizera. 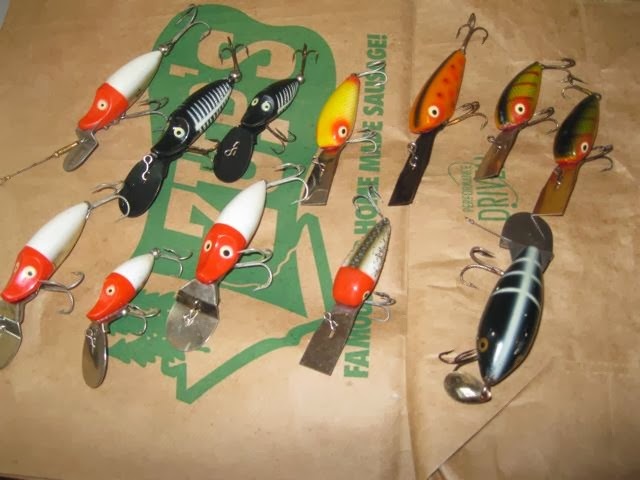 Here are some pictures of Frank Mizera and John Novak Trout jigs. Normally Mizera made fins that were not completely rounded on their edges. His tended to have an angle cut to them. 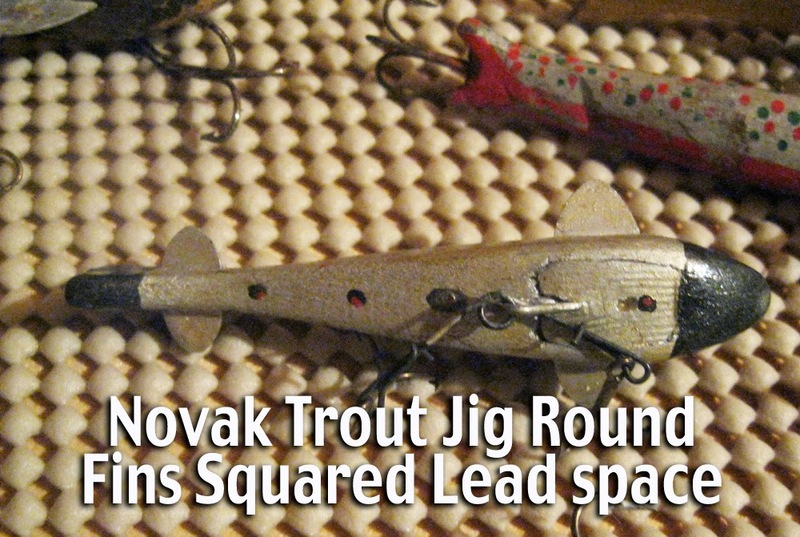 Novak's were usually rounded until they began to get larger around the normal decoy size and then they seem to have an angular shape as well. Mizera cut a rounded elliptical hole for his lead. Novak usually did squared holes for the lead in the bottom. Novak seemed to experiment with a wide variety of colors and paint styles including some examples with foil. 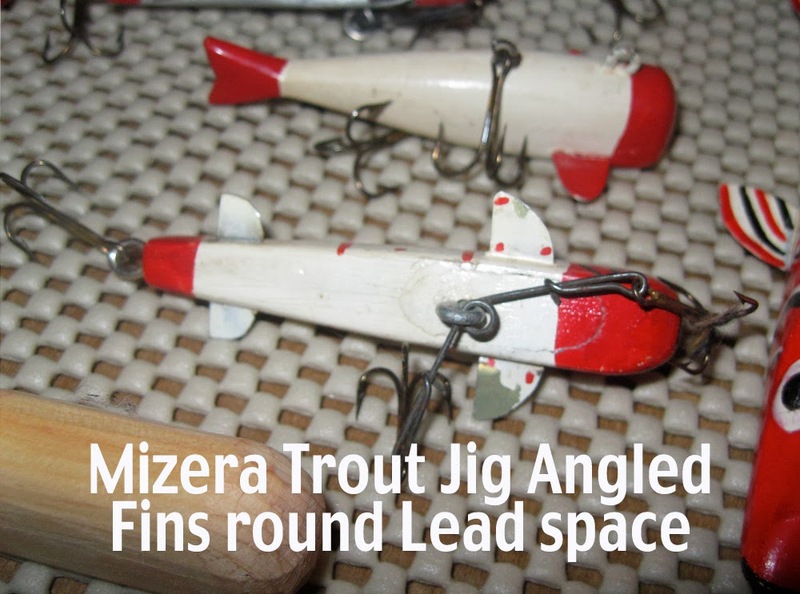 Mizera Trout Jigs. Some have tails, some don't. Most have fins that are "angular" with a "quarter circle" cut shape. Top view of Mizera Airplane Lures. Note the Cedar Blanks. 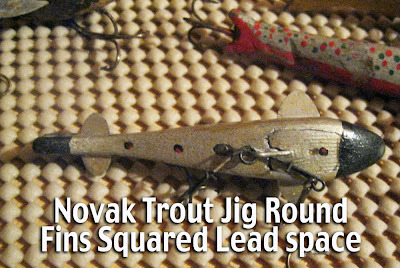 Most of Novak's wooden trout jigs have rounded fins with square lead cavities in the bottom. lures, collectibles and much, much more. Here's what he had to say: "I have this idea... I am an idea guy, someone else is going to have to do it if people think its a good idea. My good buddy Rick Relander words to me last night were bye John, I love you. Ok this is 61 year old decoy collector saying this to a 50 year old collector. I was really moved and was thinking about him. He needs help selling high end decoys. We all have them and you know what I am talking about. If you but them on ebay a guy like me will swoop them up for pennies on the dollar. Because of this these types don't make it to ebay. So this is my idea... If someone could form a facebook group of decoy collectors/carver who want to trade. Showing decoys you have in your collection that you would like to trade. 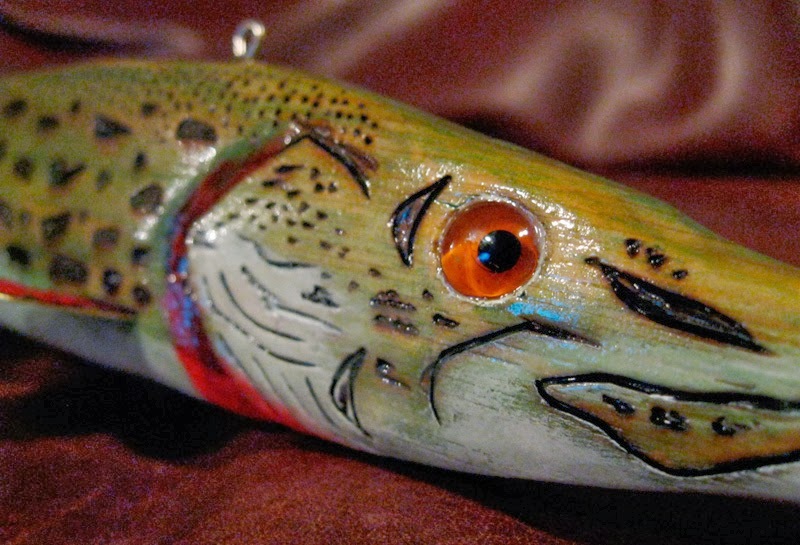 Put a value on the decoy (current 2013 value not the price you paid 7 years ago) And let others see what you have to trade and make an offer with another decoy. 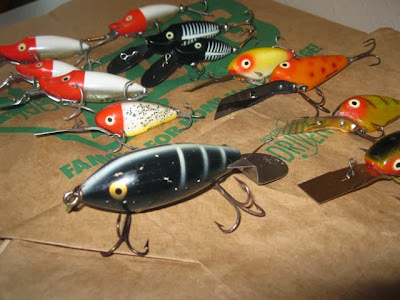 Maybe let others know the carvers you are looking for/have in your trading collection. If anyone can understand this idea and put it together this would be great." 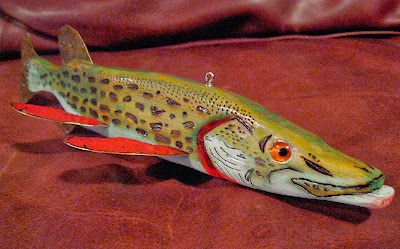 To Post: Post a picture or Album of the Fish Decoy you have for trade. 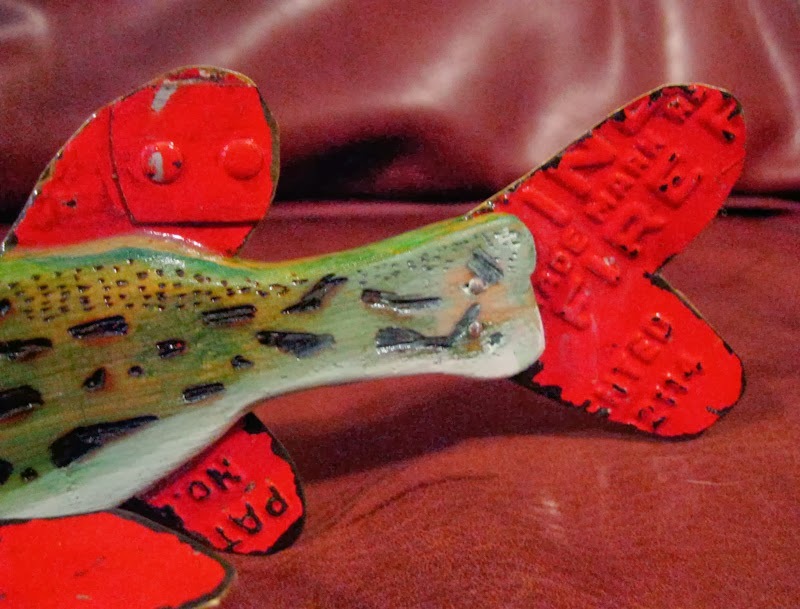 Title it (ie: Mizera Fish Decoy for Trade $350 Value or Folk Art Fish Decoy for Trade $125 value). 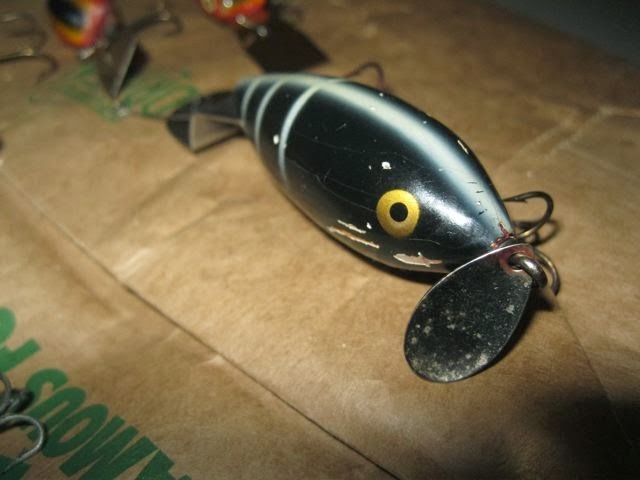 Subtitle could be something about the decoy and include your name. You could copy this info or enter new info for each picture in the album. If you Tag yourself in the photo it will also appear on your Facebook page so your friends can see and it will cause the decoy to appear in your photos. You could tag other collectors that you know might be interested. As administrator I could help you with this or create albums from individual photos. 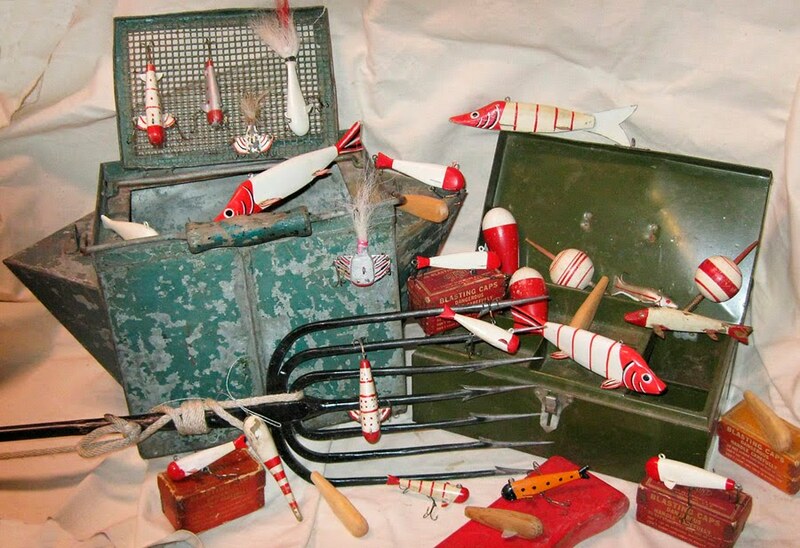 This page is for trading antique fish decoys, fish decoy spears, jigsticks or other old ice spearing decoys. 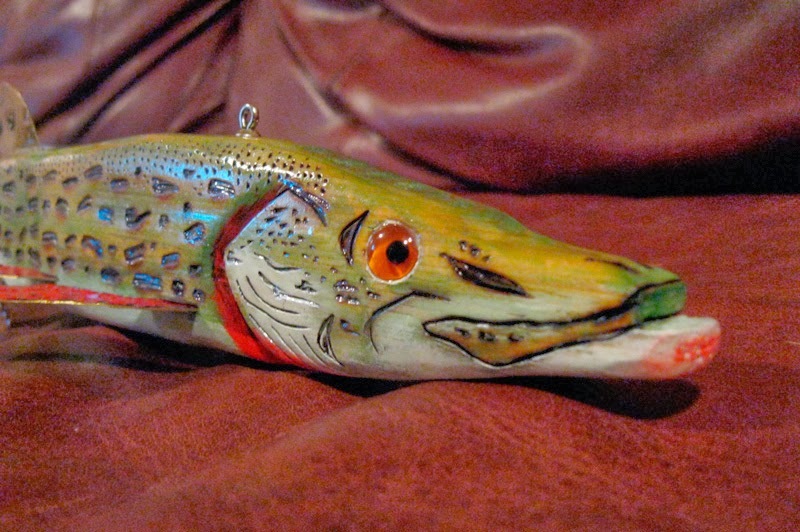 It is also for Carvers to showcase and trade their contemporary fish decoy creations. If you cannot come up with something to trade and want to pay full value for the decoy you are welcome to contact the owner with your offer. This is not a firesale venue. People using this sight are expecting fair market current value for their pieces (not what they paid for it at market peak and not a low-ball offer). 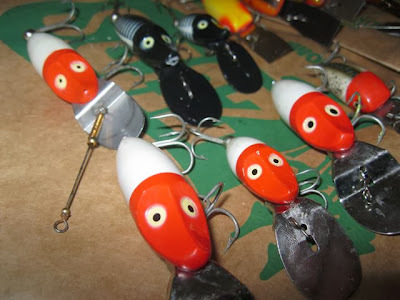 Trades should be made for "like value" decoys or groups of decoys. 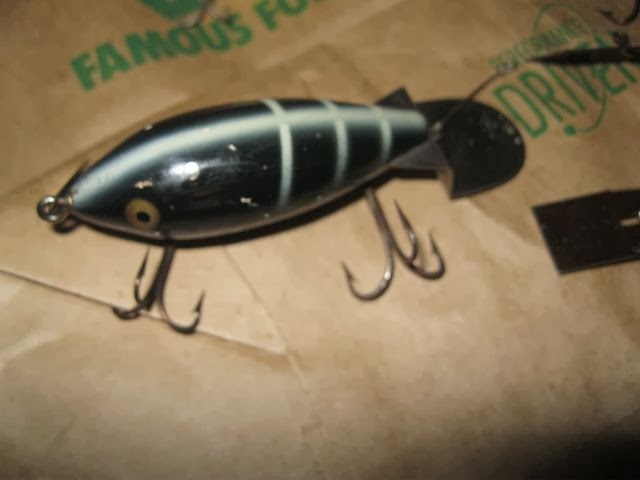 As administrator I will delete posts that are spam, contain content other than fish decoy themes, bad language or non-family-friendly content. Be on your best behavior. I am not responsible for any transactions and will not be held responsible for transactions gone sour. If you sell something as a result of your relationships here you are responsible for reporting and taxes. If something is no longer available, please post in a comment. Do not delete your posts as we will keep them for historical and value purposes. 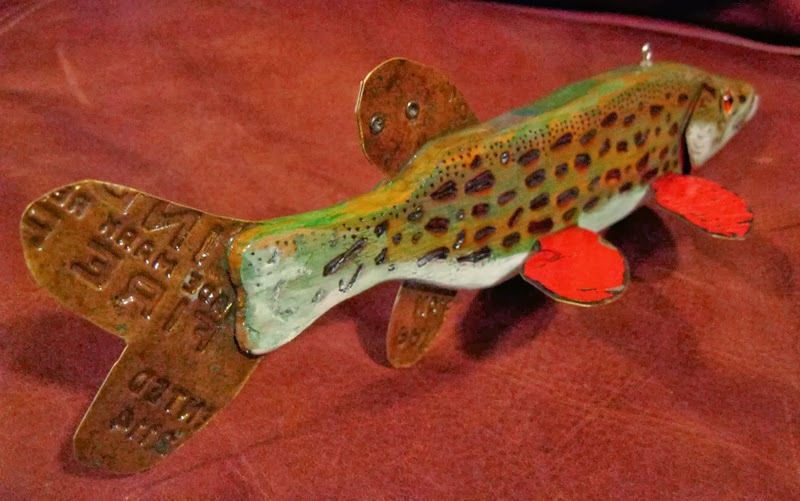 We want to encourage young and old carvers and collectors to participate and in that vein please showcase and post your contemporary fish decoy carvings and feel free to trade/sell those as well. 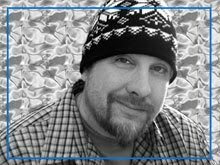 As we begin I will not charge anything for maintaining this page or promoting it on my blog and websites. I may at some point add some way to donate if you like and if you participate in transactions that are favorable you might consider sending me a tip via paypal or not. You can message me in facebook to find out how. If you don't want to that's fine, I'm doing this for fun and because it is a great idea. 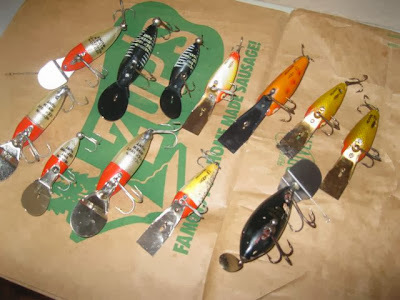 I collect Frank Mizera fish decoys and trout jigs often called airplane jigs or cheater decoys. 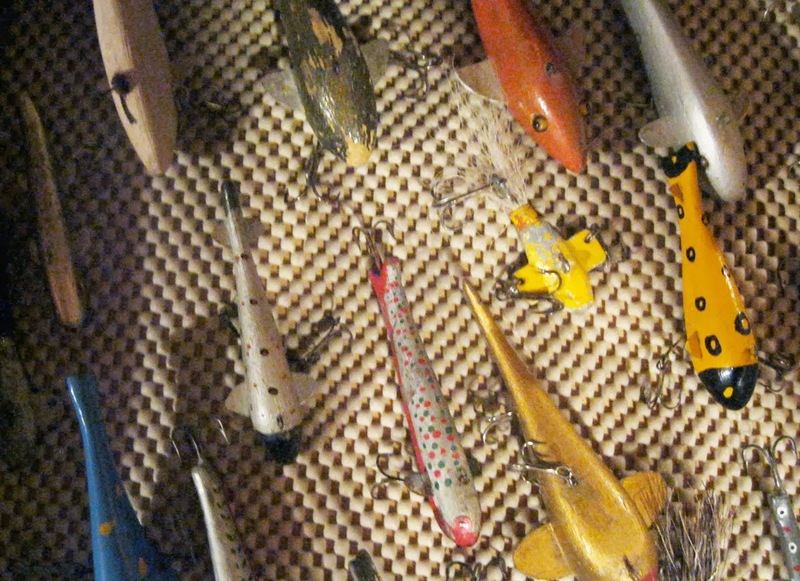 I have an extensive collection of Otis Lael Decoys and Folk art and I love folk art. I'm a carver myself. I like carving and collecting frog decoys. Let me know if I can help. We can also collect info here and write history/collecting notes and this place can become a real resource for future collectors and carvers. p.s. Thanks John Werlich and Rick Relander for this idea. I collect Frank Mizera fish decoys and trout jigs often called airplane jigs or cheater decoys. 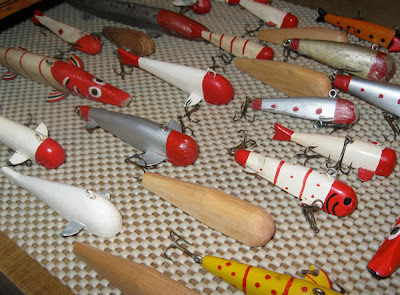 I have an extensive collection of Otis Lael Decoys and Folk art and I love folk art. I'm a carver myself. I like carving and collecting frog decoys too.